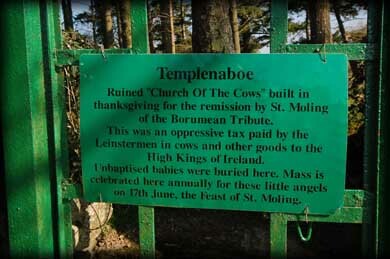 Located north of St Mullins monastic site in Carlow is the ruin of Templenaboe, a small church built in thanksgiving to St Moling who freed the people of Leinster from paying the Borumean Tribute. This was an oppressive tax consisting of 5,000 ozs of silver, 5,000 cows, 5,000 hogs, 5,000 wethers (castrated goats or sheep) and 5,000 vessels of brass or bronze. 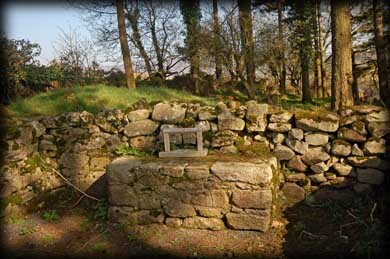 This tax or tribute had to be paid every second year by the people of Leinster to the High Kings of Ireland. Very little remains of this small church. 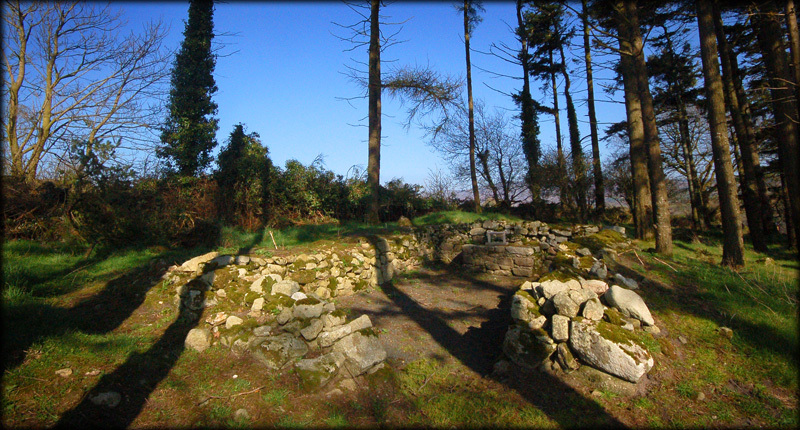 The walls are about 8.5 metres in length by 5 metres wide, standing at no more than 1.25 metres high. At the eastern end of the church is a small stone altar, pictured right. Sadly this site was also a place where unbaptised children were buried. Local children are asked to play an important role in a mass that is still celebrated here on St Molings feast day the 17th June. The mass commemorates the the unbaptised children. We were blessed with gorgeous weather on our visit, which added to the wonderful peaceful feeling we experienced at this small ruin nestled in the trees. A visit to St Mullins would not be complete unless you call here. 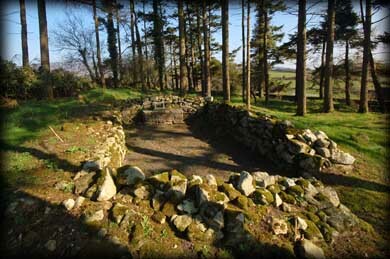 Situated: About 1.5 kilometres north of the monastic site at St Mullins. From there drive straight through the crossroads and up the hill. The church is located in a small grove on the eastern side of the road. Discovery Map 68: S 7299 3875. Last visit March 2011.